Some free petite treats from Starbucks. One of the fun things about a birthday party is that it’s not just the birthday boy or girl who gets all the goodies. Yes, they get the lion’s share of fun, but they share it with everyone else. I mean, the best part of a birthday is cake and ice cream, and everyone gets a taste of that. In the spirit of a birthday party, Starbucks will be giving customers free desserts to celebrate its 40th birthday. From today until Saturday, from 2-5PM, your local Starbucks will be giving you the treat for its birthday. 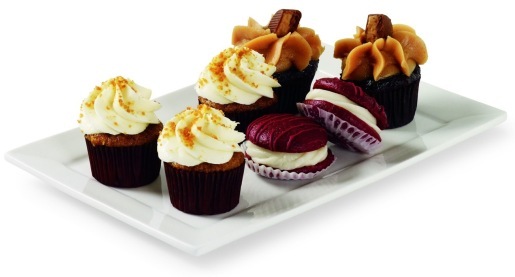 If you purchase a regular drink, you’ll get a free petite treat from their new line of under 200-calorie desserts. Among the petite treat lineup are a red velvet whoopie pie, a tiramisu cake pop, salted caramel squares, mini cupcakes, and other various and sundry deliciousness. The new line of petite treats isn’t the only change for Starbucks during its midlife crisis. The company is also unveiling a new blend of coffee, dubbed the Starbucks Tribute blend, which is a mix of Sumatra, Ethiopia, Papua New Guinea, and Colombia coffee beans. In addition, there’s a new drink, the cocoa cappuccino, which sounds incredible.